50,000 gallons of water fill this indoor waterpark resort at the foothills of the Smoky Mountains. 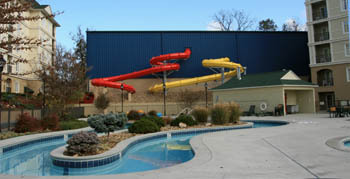 Beyond the two body slides, guests can play water volleyball, basketball, or relax in the 20-person jacuzzi tub. Swimmers will like the Bandu Waterjet system, where an endless pool effect is created by swimming towards the relentless current. Kids also get in on the fun with a wading pool area complete with a raining umbrella.